Departed Motherwell midfielder Andy Rose – all set for a new football career across the Atlantic Ocean – has revealed that he’ll always look out for the Steelmen’s results, writes Craig Goldthorp. The 28-year-old Australian will soon travel out to Canada to join up with Vancouver Whitecaps, ending an 18-month association with Motherwell which included helping the club reach both national cup finals and helping the club to a 2-1 derby win at Hamilton Accies in his final match for them on December 29. Rose told the Times and Speaker: “I will look back on the success we’ve had and the memories we’ve made at Motherwell over the last 18 months. “Then quickly my attention needs to look forward to the future and I look forward to getting out there. “Getting the chance to leave Motherwell in the way I have doesn’t happen to every player. I’m really fortunate in that regard, to leave on a high note. “And with the respect to the guys and the coaching staff. “Without a doubt, I’ll still look out for Motherwell’s results. “It will be the first score I’ll check every weekend. “I can’t wait to see where they end up at the end of the season. “I’m really confident that they can climb the league and finish slightly higher than ninth. “I think it is a great group of players. “The manager has added to that in January. “I think a lot of little things went against us this season. “We’ve lost a few games by the odd goal and conceded some late winners. “I think by the end of the season your luck usually evens out in my experience. “I think for sure the club should be looking up towards that top six. 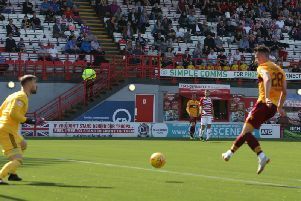 Rose scored two goals in 53 games for Motherwell.